This is just what I wanted. Had a hard time finding the dark finish. It was for a little used guest room and is perfect for that - I would even like to have it in my room. Construction is good. I would purchase it again.
. This product ships in three boxes. Nice, heavy chest of drawers. I ordered two of these dressers, and I just put one of them together. It took me about 6 hours to assemble, but I was working by myself. For the most part, the directions were intuitive and they even threw in a few extra screws/dowels/etc. for good measure. Each dresser came in three large boxes weighing about 50-60 lbs each. They were packed very well--not a nick or scratch on any of the pieces as I inspected them right out of the box. You really need to pre-drill some tiny holes in the drawers before attaching the rails with the screws, otherwise you risk splitting the wood (everything else came pre-drilled). When all is said and done, I think it's worth it to save a few hundred dollars to assemble the furniture yourself. I would put this furniture quality on par with xxxxxx or some other shops like xxxxxxx, etc. We purchased the Wavelength dresser, 2 nightstands, and 6 drawer chest 3 years ago. They look great in our master bedroom and have held up well. In my opinion, the rippled detail on the top drawer makes the set look more ‘store bought’ than home-assembled. There are a couple of places on the front where the color variation in the wood makes it possible to tell that the drawers are not faced with solid wood, but smaller pieces joined together. Not very noticeable. The drawers work quite well – the drawer slides are probably not as smooth as a more expensive set, but the drawers are loaded and used daily with no problems. After reading the reviews, we covered the drawer bottoms with clear contact paper before assembly and haven’t had any problems with color transfer. Assembly of all the pieces took a while, but a fun project. I built drawers while my husband put the cases together. 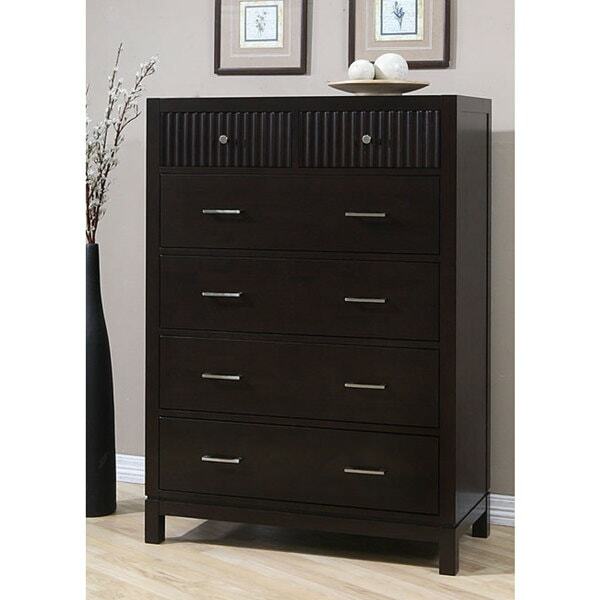 We also purchased the Aristo 5-drawer lingerie chest in a brown finish and it matches really well. In retrospect, I probably would have mixed it up a little by using more Aristo pieces so the room was less “matchy”. Later we added the Real Flame Chateau Dark Walnut Corner Electric fireplace, and the colors match perfectly. I am glad we went with Overstock for our bedroom furniture. This is my first Overstock purchase and I am extremely pleased with the finished product. My husband and I put the dresser together in about 4 hours. The directions were a little confusing as one of the pictures showed the assembly backwards. But we figured it out and built this beautiful dresser piece by piece. This color is mostly black with hints of brown. Some of the drawer pieces arrived damaged and were replaced by Overstock within a week. There customer service is awesome and I ordered the new parts in an online chat session. The new pieces are on the sides of the drawers. Be careful when tightening the screws as they can split the wood if you do it too fast. We purchased this piece to go with the Waynesborough Queen bed. They are both made of sustainable rubberwood--smooth & rich looking. I am now waiting for the Wavelength Lingerie Chest. It is currently out of stock. We have lt. blue walls and the dark furniture with some white accent pieces created the exact look I wanted. After having shopped around at the local stores for furniture I decided to take my chances on Overstock.com. So glad I did! Most furniture we found was 2-3 times the price of this furniture line (wavelength) AND was very cheaply constructed. We purchased two night stands, the dresser and the chest. It took my husband and I ALL day to put everything together but with what we saved and the quality of the furniture it was a day well spent! The furniture is SOLID. No flimsy drawer bottoms or backings! There are ALOT of pieces and you need to be good at reading directions but everything fits together well. You MUST use an electric drill. If you screw everything in by hand you will probably get carpal tunnels syndrome AND take 3 weeks to put everything together. Our recommendation is to divide up all your parts and then start with the drawers. We had a little system going when I did what I could with popping in the metal screws and using a rubber mallet on the wooden pegs; then my husband used the screw driver to tighten the screws and lock down the tracks. This worked really well! Make sure you pay attention to details. Thank goodness we made the mistake in the beginning on a nightstand. There IS a right and wrong side for some of the wooden dividers that go on the front of the furniture. After putting together a night stand we noticed we used the almost black side of the wood for one piece instead of the brown side. It's hard to tell until you line the pieces up side by side but then you see the difference. BE DETAIL ORIENTED! The only con we found with this furniture is on both of the large items- the chest and the dresser, there is one drawer on each that seems tighter than the rest. It's not a big deal but it will probably be an uavoidable aspect of assembling your own furniture. All in all we are super happy with this purchase! Chest came undamaged in 3 large boxes. Putting the chest together was straight forward. Installing the drawer slides, not so much. Orientation of the chest drawer slides is unclear in figure 2. The orientation of the slides is better shown in figure 3. The open side at the end of the slide should be oriented upward to allow the drawer to be inserted from above. Figure 11 is more confusing, the drawer slide attachment is shown as is it should be attached to the bottom of the drawer and extend downward. The drawer slide angle in fact covers the bottom of the drawer side and the wheel flange extends along the side of the drawer. Once you have this right, the drawers fit perfectly. The 6 drawer chest is well made, however you are working with chip board and it is advisable to drill pilot holes for any screws to prevent the chip board from splitting. The Wavelength chest is a solid piece of furniture. A bit of warning, it is very tedious to put together. With two people, it shouldn't take more than a day. But be prepared to work. I put it together by myself and it took 1-1/2 days. The color matches the online photo exactly. I loved that the drawers came with metal drawer glides that attaches to the bottom sides of each drawer. It makes opening and closing the drawers smooth. It shipped in 5 days and was packaged very neatly in 3 boxes. It's important to organize the pieces by alphabetical and numerical order to lessen confusion with instructions. The only bad part was one back panel to a small drawer on top had holes drilled 1/2" too far down, so the holes didn't like up with the slot made to fit the drawer's bottom panel. But I called Overstock and the rep put in a replacement order for just that piece right away, which I received within the next week. Very easy and convenient. I am very satisfied with this chest dresser! I did get this on sale, but even at the regular price I think this item is a great value. The pieces are nicely made and the wood is solid. Drawers fit and glide nicely, and seem to be able to hold a decent amount of weight. The color is just as pictured on the site. As other reviewers have noted, it is an extensive assembly. I have a decent amount of experience assembling this type of furniture, and I am very handy. I bought two- the first one took me 4 hours, the second one took 3. As long as you take care to double check you haven't missed one of the very numerous steps it is straight forward, and the instructions and hardware kit are complete. Once assembled properly it feels quite sturdy and solid. I do highly recommend a power screwdriver, as there are a bazillion screws and cam locks. I also had to employ a hand held sledge with a towel wrapped piece of scrap wood to protect the furniture from the hammer, as getting the pieces to fully squeeze together required this extra power. I would recommend this to anyone desiring a mid-grade quality piece of furniture. It is a massive step up from the Swedish design type MDF furniture I am replacing, and for a comparable price as the lower quality stuff. This is a great value for the money - with one caveat - it's extremely labor intensive to put together. There were so many pieces. Fortunately they were labeled, but it still took over three hours to assemble. All the drawer slides had to be installed as well as everything else being assembled. However, it was well worth the time and money. It's a quality piece of furniture. I couldn't find anything in a store for double the price that came close to the quality. Love every aspect of the Wavelength furniture set. they are well made, sturdy and looking great in my home. The chest is taller than most chests, does the job, the drawers move in/out smoothly. I wish they had more pieces to match this set!! After about a year, this item started falling apart. While the front of the drawers are wood, the sides and back of drawers are made of some cheap material that is basically fancy cardboard. The interiors of the drawers became misshapen and the backs of the drawers started to come apart from the sides. Save your money and purchase a piece of furniture that is truly all wood, not this piece of junk that only has wood cabinet fronts. Since this no longer holds clothes well since the back of the drawers keep falling off, we are going to throw this away and buy something else. The dresser takes a while to put together. I would recommend using an electric screwdriver if possible because my hands/fingers are a bit sore/blistered from the assembly. Overall the dresser is a nice size. Tall, roomy but not too bulky. The directions are pretty straightforward, and all the necessary pieces were included. I bought this to go with a simple platform bed (not of the same set) but the wood colors seem to match and I'm relieved that I can fit a lot of clothes into this dresser and unclutter my closet! Probably the best dresser I've owned in terms of appearance and space. Plus the price is a lot better than other dressers I've shopped for online. It is an absolute pain to build this. it does not take long but the directions were so bad. most of it was easy to follow but some parts you had to sit back awhile and figure it out yourself. it is a beautiful dresser but its not very sturdy although its made or very heavy and nice wood. I think you really do need a drill in order for this to come out perfect and not wobbly. I don't have the drawers in mine yet because I want to get a drill to get every screw nice and tight because as of right now it does not seem very stable. I think for this price would be able to find an already built dresser somewhere else and not have to go through the struggle. They took great care of the outside parts of the dresser but the insides had scratches and dents in them. I bought this one as wells at the matching 9 drawer dresser and im waiting to build up energy to build that one. although its beautiful its just not worth the effort or the time. I should of just bought something from ******* **** and got something of a bit higher quality and already put together. This piece is far too difficult to put together, mostly because the instructions don't give enough information. For instance, the instructions don't tell you which way the drawer slides go in and the front and back are not labelled. I had to hire a carpenter to finish the piece and I'm pretty handy and not an idiot. I would not recommend this item to anyone because of the problems with assembly. I love the look of this dresser and the size is exactly what I needed. Being a piece that requires assembly, one would hope that there would be no need for adjustments. However, the top piece did not have pre-drilled holes on one end, as it should have. It is near impossible to repackage such a heavy item (3 cartons / over 50 lbs each) for return, therefore, I had no choice, but to drill the holes myself. What I had hoped would be a perfect piece, now has a slight imperfection. One of the top drawers hits slightly as it closes. This dresser was a little pricey for this much trouble. It is a beautiful piece and I do plan to purchase the matching nightstand. I just hope for a less difficult assembly next time. This chest of drawers was purchased for my son's bedroom. It is very well made and the color is a deep rich dark brown. It is very sturdy and my son loves it. He was able to put it together himself...although I should note that he is a college student studying engineering. Not sure if that's why he put it together effortlessly. Love this chest, bought dresser and night. Nice heavy furniture. Beautiful and well made. Easy to assemble. Highly recommend. Easy to put together, solid wood, very heavy. "Item currently out is stock. Do you expect to receive more of thi item in the future? If so can I request to put mysel on the waiting list?" Please add your email to the item page to be notified when this item comes back in stock. Items are restocked as they become available. "What are the size of the handles? 4 inch?" Hello medebbieme, the handles are 4.6 inches long. Thank you for shopping with us! Terri D.
"Do the drawers have metal glides?" Yes the drawers have metal glides. Thank you for contacting us furbaby01. Yes, the drawers have metal glides. Please let us know if you have any further questions. Thank you for contacting us, the gross weight for Wavelength 6 Drawer Chest is 88.00kgs or 193.60lbs & the net weight is 72.00kgs or 158.40lbs. Please let us know if you have any further question. "What is the construction of the drawers? Are they dovetailed?" Thank you for your interest, unfortunately this information is unavailable. Sorry for the inconvenience. I bought this and they are not dovetailed, you assemble everything with screws. "How deep is each drawer? In other words when you open it, what is the measurement from the top to the bottom of the inside of each drawer?" The interior drawer dimension of Wavelength 6 Drawer Chest as below: small : 14.02 W x 15.04 D x 3.90 H large : 31.14 W x 15.04 D x 6.65 H.
"Who is the manufacturer of this Wavelength line?" We sincerely apologize, but we do not have the manufacturer''s information for this item.